The 1870-S Half Dime represents one of the most enigmatic rarities in American numismatics. According to official mint records no examples of the coin were ever struck, yet a single example was discovered in 1978. 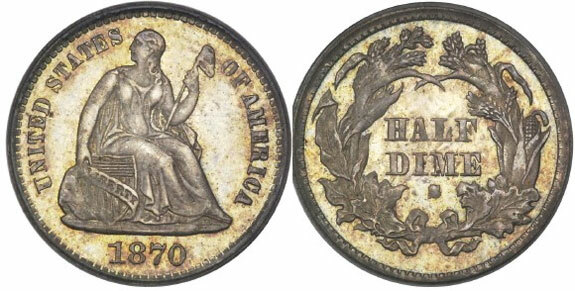 This represented a major numismatic event and added a unique date to the series of Liberty Seated Half Dimes. The story of the discovery has been recounted in various references and although it seems fantastic, it has been confirmed multiple times by major numismatic scholars. The unique 1870-S Seated Liberty Half Dime was originally discovered in a dealer’s “junk box” containing common, low value coins. Shortly thereafter, it would be publicly exhibited at the 1978 American Numismatic Association convention held in Houston, Texas. The coin was examined by Kam Ahwash, notable expert on Seated Liberty coinage, and Walter Breen, major numismatic scholar, and declared a genuine. The cornerstone of the second San Francisco Mint was laid in 1870 and it is believed that this event led to the creation of the 1870-S Half Dime, and the other unique 1870-S denomination, the 1870-S Three Dollar Gold piece. The information about these two unique pieces is based on a small slip of paper that accompanied the latter at its first public offering in 1911. The paper contained a note from J.B. Hampstead, Chief Coiner of the San Francisco Mint in 1870, indicating that two examples of the 1870-S Three Dollar Gold Piece had been struck, with one placed at the cornerstone of the new Mint and the second kept as a duplicate. While unconfirmed, most numismatic researchers believe that the information provided in the note by Hampstead also applies to the 1870-S Seated Liberty Half Dime. If this is true, then examples of the two unique coins could still be retained within the cornerstone of the second San Francisco Mint, possibly along with other 1870-S dated coins of other denominations. Since the 1870-S Half Dime is a unique coin, the grade is perhaps not as important as for other rarities where multiple examples exist. For a long time, the coin had been graded MS63 by both PCGS and NGC. The coin was eventually upgraded to MS64 and housed in a PCGS holder as part of the Law collection, the greatest (and one of the few complete) sets of Seated Liberty Half Dimes that have recently been publicized. The unique coin shares some characteristics with other San Francisco Half Dimes of the same era. Most notably it is slightly weakly struck in the upper left reverse. The mintmark on the reverse is filled and not immediately recognizable as an “S” without closer examination. When the issue was first identified as genuine in 1978, it was also determined that the same reverse die was used to strike 1871-S Half Dimes. The coin has medium orange coin toning on both sides, and its eye-appeal is excellent, despite being slightly weakly struck. The first publicized sale of the 1870-S Liberty Seated Half Dime occurred in 1978 shortly after its discovery. The coin was sold for $425,000 to John Abbott, with the price determined as $25,000 more than an 1804 Silver Dollar that was sold as part of the John Work Garrett collection. During the 1990’s, the coin would be offered on the public market for 1.5 million dollars. If it had been sold it would have become one of the most expensive U.S. coins at the time, however a buyer was never found. The coin made its first appearance at a public auction in July 2004 when it was offered in the 2004 Bowers & Merena auction of the Jim Gray North Carolina collection, although the coin was not actually part of the Jim Gray collection. In the sale it brought a then amazing price of $ 661,250. In 2009, the 1870-S Half Dime would be sold privately for a price of $1.4 million.